Paris town Supervisor Ron Kammerzelt announced at Tuesday’s Town Board meeting that he will not run for re-election in April 2019. April 2019 will mark his 12th year on the board, Kammerzelt said. He intends to fill out his current term. Kammerzelt started off his comments talking about accomplishments of the town during his tenure on the board. Foremost among these, he said, was an agreement with neighboring municipalities setting Paris’ eastern boundary. Such a boundary was the main reason he ran for the Town Board. That was accomplished with the 2016 with the I-94 development, border and extension of water/sewer service between Paris, Somers and Kenosha. “I’m proud of that,” Kammerzelt said. After the agreement — which some residents strongly objected to at public meetings — Kammerzelt won a recall election challenge in 2016 with 61 percent of the vote and and re-election in 2017 with 62 percent of the vote. Kammerzelt also thanked his colleagues. 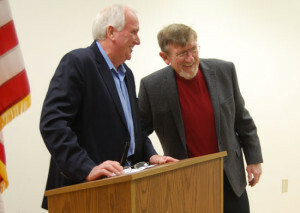 Town Chairman Virgil Gentz on Monday thanked Kammerzelt for his work on the board.